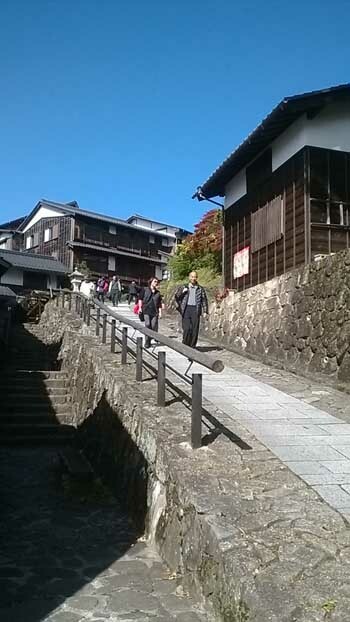 The Magome-Tsumago trail in Japan is part of the 700-km Nakasendo Highway in Kisoji (or Kiso Valley) which extends from Nagano Prefecture to Gifu Prefecture, weaves through and along the mountains of the Central Alps. 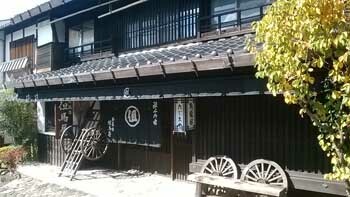 The Highway was a vital ancient route for traders travelling between Tokyo and Kyoto during the Edo period. 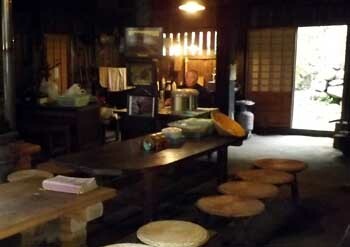 Defying time and change, both Magome and Tsumago are post towns which were rest stations for those traders. Both are joined by the trail like a red thread that draws a good marriage between yin and yang. 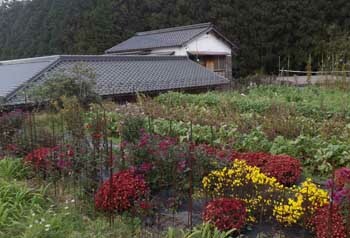 The traditional village houses teeming the heart of Magome was gradually replaced, as I kept going uphill, by grassy fields and masses of woodland trees on both sides of the trail, like willowy girls wrapped in auburn Kimonos. The path led to the peak of Mount Ena, elevated at more than 2,000 m, where I enjoyed a bird-eye view of the surrounding mountains in Kisoji. 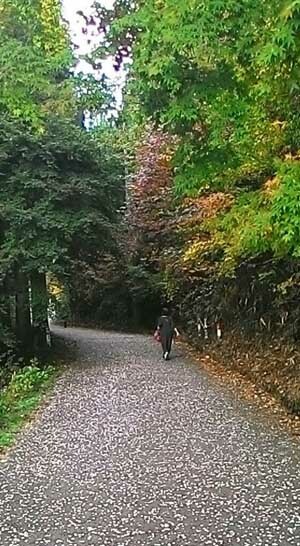 The match-box houses and the massive maple richness were serenading me from the depth of the valley. I enjoyed a moment of reminiscence, peace, and magnificence there, feeling myself light and powerful, like a heroine ready to fulfil her destiny! Then, the crossing of an empty highway welcomed the first sight of a ‘real’ village. All Magome’s busy-ness vanished. An old lady appeared in this New World I entered, came carrying twigs in a rattan pack basket. She plodded towards the path from one of the farms, hunched with the weight of her burden. Upon noticing my presence, she waved at me and I waved back. Her body looked frail but her footsteps were steady. Her tanned, wrinkled face was shining with infinite vivacity. She was beautiful. I bit a mouthful of the grilled sweet potato. It was gluey and bland, did not taste as good as the ones I ate in China and Malaysia. But I savoured them, as I savoured the thought of how beautiful life could be if we believed that our happiness, wellness, and beauty were our birth rights and claimed it fully regardless of what insecurity and negativity our dominant culture tried to convince us about aging. My lightened footsteps carried me through, passing by a pavilion and more farms with vegetables whose names were unknown to me. The wooden rustic décor exuded an air of intimacy, dissolving social barriers and time lapse. I sat gingerly at the table on which a pot of tea and some teacups was set. The man came to offer me some sweets, still smiling profusely. He dressed in a Yukata, probably in his 60s, rather well-built but soft in his face. There was something about him -- his sense of pride, his bearing, his existence, or his social standing, whatever it was -- that made him respectable but not threatening. He asked me where I was from in his sincere and confident English. I was sure he was an admiral, commander or samurai in his earlier life. There were no incidents in the woods. ‘The entire Kisoji is in the mountains’. Toson Shimazaki’s words echoed through the woods. The roller-coaster trek was the rise and fall of the romantic poet and naturalist writer’s empires, of the peaks and valleys of his life. Like leafing through the pages of Yoakemae (Before the Dawn), the refreshing fragrant air brought back a misplaced time during the Meiji Restoration. Surrounded by flickering lights filtered through bamboos, my consciousness was now part his immortal temple, with my awareness of Eternity heightened in my ephemeral body. 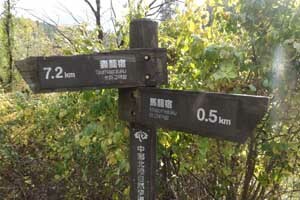 Was this the trail that Shimazaki took everyday as a meditative practice to strengthen his literary muscles and spiritual connectedness with all lives in the cosmos? Was this the home for his inner rebel who was dying to be free, free from the pseudo-hyper-modernity that dictated how his life should have been bound? Is this the answer for all that we – peace-seekers, beauty-makers, soul-lovers -- are looking for? Now, at the home of this literary genius’ soul, the gurgling stream running under a wooden bridge seemed to be teasing my overwhelmed sentiments. The waterfalls cleansed away my doubts and pre-occupations. The crisp air permeating all around me -- all Elements, all thoughts and feelings -- reminded me of how close I was with everything seemingly so distant -- the past, present, and future -- of how limiting my views and sensory perceptions had been. It was round with a humming sound. On one side of the clearing, a red-and-white sign stood outside of a row of obscured rooms from which the tune came. I sought the source of the music which led me to the unlikeliest place from which it could come -- one of the toilets in the row, as I now found out, in a mass of pitch-darkness. Thank you, this Journey of mine. I owed it to the three beautiful soul strangers and an immortal artist of literature for the universal messages I received.